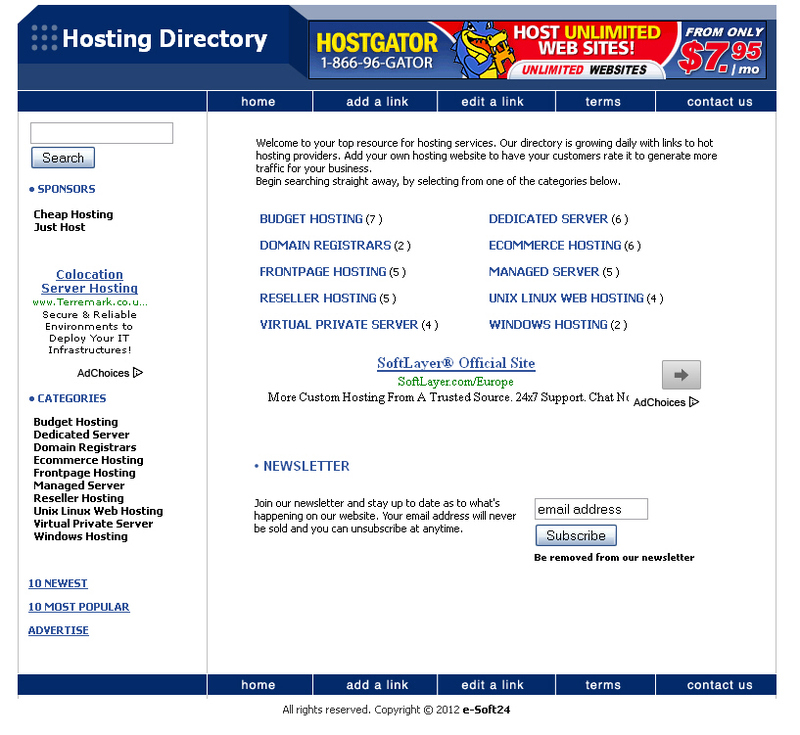 Our Hosting Directory Script is an easy to use PHP script for starting your own web hosting directory site with ease. It is ideal for adding your own hosting affiliate links and earning a lot of money from it. Promoting hosting providers is a very reliable business, because a lot of host providers offering an affiliate program with commissions up to $50 and more per sale. Therefore this PHP script has a huge potential to generate revenues through affiliate commission when your visitors signup for a hosting plan through your site. Furthermore you can sell Banner Ads, Sponsor Links and Newsletter Ads space. A banner rotator for 3 site wide banner positions is already integrated to this full featured hosting directory script. This script is so easy and fast to install and setup that you can get your business running in minutes! So what are you waiting for? Start your own web hosting directory web site now for only $49! - Browse the Newest and Most Popular Links. - Search engine friendly speaking url's (Optional). - Automatically dynamic generated meta tags (Important for high search engine listings). - Easily customize the script colors by switching between six site style colors (red, chrome, green, orange, purple and blue) in the admin panel. - IP based rating system. - Users can add and edit links without registering. - Option to add a 125x100 image to the listing. - Newsletter subscribe and unsubscribe tool. - Search function on every page. - Report dead link tool. - PayPal ready advertise page to sell ad space with your own ad rates. - 3 banner rotators for 3 site wide banner positions. - Captcha security image on the add link page, to prevent spam entries. - Manage the main site settings like meta tags, site style color, link approval, paypal email, number of links to display on each page. - Add, edit and delete categories. - Add, edit, approve and delete links. - Add, edit and delete banners for the banner rotators. - Add, edit and delete sponsored links. - Mass email feature to send newsletters to all newsletters subscribers or only to a specific subscriber.